This article is about a town in the United Kingdom. 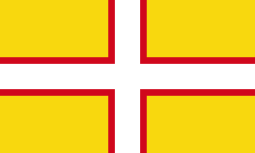 For other uses, see Bournemouth (disambiguation). 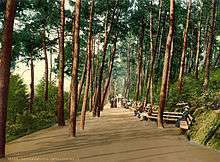 Bournemouth is about 94 miles (151 km) southwest of London at 50°43′12″N 1°52′48″W﻿ / ﻿50.72000°N 1.88000°W﻿ / 50.72000; -1.88000Coordinates: 50°43′12″N 1°52′48″W﻿ / ﻿50.72000°N 1.88000°W﻿ / 50.72000; -1.88000. The borough borders the neighbouring boroughs of Poole and Christchurch to the west and east respectively and the East Dorset District to the north. Poole Bay lies to the South. The River Stour forms a natural boundary to the north and east, terminating at Christchurch Harbour; while the River Bourne rises in Poole and flows through the middle of Bournemouth town centre, into the English Channel. The towns of Poole, Bournemouth and Christchurch form the South East Dorset conurbation with a combined population of over 400,000. 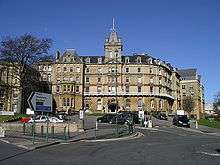 Bournemouth is both a retail and commercial centre. Areas within Bournemouth include: Boscombe, Kinson, Southbourne, Springbourne, Throop, Westbourne and Winton. The area's geology has little variety, comprising almost entirely of Eocene clays which, prior to urbanisation, supported a heathland environment. Patches of the original heath still remain, notably Turbary Common, a 36-hectare (89-acre) site, much of which is designated a Site of Special Scientific Interest. This heathland habitat is home to all six species of native reptile, the Dartford warbler and some important flora such as sundew and bog asphodel. Small populations of Exmoor pony and Shetland cattle help to maintain the area. Bournemouth is directly north of Old Harry Rocks, the easternmost end of the Jurassic Coast, 96 miles (155 km) of coastline designated a World Heritage Site in 2001. Bournemouth's own coastline stretches from Sandbanks to Christchurch Harbour and comprises mainly sandy beaches backed by gravel and sandy clay cliffs. These cliffs are cut by a number of chines which provide natural access to the shore. At the easternmost point lies Hengistbury Head, a narrow peninsula that forms the southern shore of Christchurch Harbour. It is a local nature reserve and the site of a Bronze Age settlement. Like all of the UK, Bournemouth has a temperate oceanic climate with moderate variation in annual and daily temperatures, cool summers, and frequent overcast skies. From 1981 to 2010 the annual mean temperature was 10 to 11 °C (50 to 52 °F). The warmest months are July and August, which have an average temperature range of 12 to 22 °C (54 to 72 °F), while the coolest months are January and February, which have an average temperature range of 1 to 8 °C (34 to 46 °F). Average rainfall in Bournemouth is around 800 mm (31 in) annually, well below the national average of 1,126 millimetres. Since 1960, temperature extremes as measured at Bournemouth Hurn Airport have ranged from 34.1 °C (93.4 °F) in August 1990, down to −13.4 °C (7.9 °F) in January 1963. The lowest temperature recorded in recent years was −10.4 °C (13.3 °F) in December 2010. ↑ Agriculture data is excluded from ONS figures at a sub-regional level, therefore an estimate has been made using DEFRA 2010 data. As there is little farming within the Bournemouth area, this has a minimal effect. ↑ A. McKinstry, The Village of Tuckton, 35,000 BC - 1926 (Christchurch: Natula Publications, 2015), p. 12. ↑ Page, William, ed. (1912). "The liberty of Westover: with Holdenhurst and Bournemouth". A History of the County of Hampshire. 5. Constable & Co. pp. 133–137. ↑ John Walker (March 2010). "The Beginnings of Bournemouth". Dorset Life Magazine. Retrieved 23 October 2012. 1 2 3 "Bournemouth, Garden by the Sea" (PDF). Diamond Jubilee Civic Honours Bid. Bournemouth County Council. May 2011. p. 3. Retrieved 9 September 2012. 1 2 3 "History of Bournemouth Pier". National Piers Society. 2012. Retrieved 12 October 2012. ↑ Denton, Tony (2009). Handbook 2009. Shrewsbury: Lifeboat Enthusiasts Society. p. 59. ↑ "South Coast alert after attack on resort: Bomb found under Bournemouth". 1993-08-13. Retrieved 2016-08-19. 1 2 3 Steven Morris (20 January 2010). "England's most hated building to be demolished". The Guardian. Retrieved 10 February 2013. ↑ "Work to lower height of Dorset's Imax building starts". BBC Dorset. 18 March 2011. Retrieved 10 February 2013. ↑ "Cinema to be demolished to restore famous view". The Telegraph. 21 January 2010. Retrieved 10 February 2013. ↑ Slade, Darren (14 March 2012). "Bournemouth loses bid for city status". Bournemouth Echo. Retrieved 6 April 2012. ↑ "History of Bournemouth". Bournemouth County Council. Retrieved 13 December 2011. ↑ "Local Elections 2011". Bournemouth Borough Council. Retrieved 23 August 2013. ↑ "Final recommendations on thefuture electoral arrangements for Bournemouth" (PDF). Report to the Secretary of State for Transport, Local Government and the Regions. Local Government Commission for England. December 2001. p. vii. Retrieved 27 September 2013. ↑ "Bournemouth at a glance". 2011 council election results. BBC. Retrieved 24 August 2013. ↑ "Mayor making and annual civic service". Bournemouth Borough Council. Retrieved 24 August 2013. ↑ McDonald, Gayle (30 May 2014). "Bournemouth's new mayor Councillor Chris Mayne to start an awards initiative". Daily Echo. bournemouthecho.co.uk. Retrieved 3 March 2015. ↑ "Find your MP". UK Parliament. Retrieved 24 August 2013. ↑ "Bournemouth East". 2010 election results. BBC. Retrieved 24 August 2013. ↑ "Bournemouth West". 2010 election results. BBC. Retrieved 24 August 2013. ↑ Straight line distances from: Daft Logic. "Google Maps Distance Calculator". Retrieved 30 July 2010. ↑ "Rural Atlas". Disadvantaged Districts. Department of Environment, Food and Rural Affairs. Retrieved 27 November 2012. 1 2 "A picture of Bournemouth – Overview" (PDF). Wards and ward profiles. Bournemouth Borough Council. p. 3. Retrieved 27 November 2012. ↑ Stuart Clarke. "River Path". The Stour in Bournemouth. England in Particular. Retrieved 27 November 2012. ↑ "About the Bourne Stream". Bourne Stream Partnership. 2012. Retrieved 5 September 2013. 1 2 "Final First Detailed Proposals for RSS Sub-Regional Policies for South East Dorset.". South East Dorset Joint Study Area Reports. Bournemouth, Poole and Dorset County Councils. November 2005. p. 2. Retrieved 18 November 2012. ↑ "A picture of Bournemouth – Overview" (PDF). Wards and ward profiles. Bournemouth Borough Council. p. 2. Retrieved 7 September 2013. ↑ "Geology of Britain Viewer". British Geological Survey. Retrieved 27 September 2013. ↑ Wightman, R. (1983). Portrait of Dorset. London: Robert Hale. pp. 22–25. ISBN 0-7090-0844-9. ↑ "Turbary Common". Dorset For You. 2011. Retrieved 29 November 2012. ↑ "Turbary Common Local Nature Reserve". Bournemouth Borough Council. 2011. Retrieved 29 November 2012. ↑ "Seafront Strategy 2007–2011" (PDF). Bournemouth Borough Council. p. 10. Retrieved 7 September 2013. ↑ "Hengistbury Head Management Plan" (PDF). Bournemouth Borough Council. 2005. pp. 15 & 27. Retrieved 4 December 2012. ↑ "Hengistbury Head and its Antiquities". Pastscape. English Heritage. 2005. Retrieved 4 December 2012. ↑ "Mean Temperature Annual Average". Met Office. 2010. Retrieved 25 August 2013. 1 2 "Hurn Climatic Averages 1981–2010". Met Office. Retrieved 23 December 2012. ↑ "Mean Annual Rainfall Average". Met Office. 2010. Retrieved 25 August 2013. ↑ "1990 temperature". KNMI. Retrieved 25 August 2013. ↑ "1963 temperature". KNMI. Retrieved 25 August 2013. ↑ "2010 temperature". UKMO. Retrieved 25 August 2013. 1 2 3 4 "Religious group, local authorities in England and Wales". 2011 Census. Office for National Statistics. Retrieved 7 April 2013. ↑ "Male usual resident population by five-year age group, local authorities in the United Kingdom". 2011 Census. Office for National Statistics. Retrieved 6 April 2013. ↑ "Female usual resident population by five-year age group, local authorities in the United Kingdom". 2011 Census. Office for National Statistics. Retrieved 6 April 2013. ↑ "Age structure, local authorities in England and Wales". 2011 Census. Office for National Statistics. Retrieved 6 April 2013. 1 2 "Population trends in Bournemouth" (PDF). Bournemouth Borough Council. October 2012. Retrieved 21 April 2013. ↑ "Ethnic group, local authorities in England and Wales". 2011 Census. Office for National Statistics. Retrieved 7 April 2013. ↑ "Highest qualification, local authorities in England and Wales". 2011 Census. Office for National Statistics. Retrieved 15 April 2013. ↑ "Population". A Vision of Britain Through Time. Retrieved 25 April 2013. ↑ "Historical population of Bournemouth". A Vision of Britain Through Time. Retrieved 16 April 2013. 1 2 "Health and Wellbeing in Bournemouth: Strategic Assessment" (PDF). Joint Strategic Needs Assessment. Bournemouth Borough Council. 2012. Retrieved 21 April 2013. 1 2 3 "Key Facts – Economy". Dorset For You. 2011. Retrieved 7 September 2013. ↑ "Economy". Bournemouth Statistics. Bournemouth Borough Council. 2011. Retrieved 23 February 2013. ↑ "Economic Performance, State of the South West 2011". South West Observatory. 2011. Retrieved 10 April 2013. 1 2 3 "Current Local Economic Overview" (PDF). Bournemouth Economic Bulletin. Bournemouth Borough Council. February 2012. Retrieved 25 February 2013. 1 2 3 Business Register and Employment Services (2011). "Employment by Sector" (PDF). Bournemouth Statistics – Economy. Bournemouth Borough Council. Retrieved 29 March 2013. ↑ "Bournemouth" (PDF). Value of Tourism. 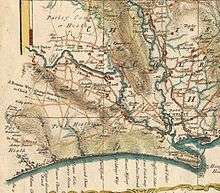 South West Research Company. 2011. Retrieved 27 February 2013. ↑ "Economy Tourism Scrutiny Panel Minutes" (PDF). Bournemouth Borough Council. 5 October 2011. Retrieved 10 March 2013. ↑ "RNLI: Bournemouth West Beach". Retrieved 16 January 2016. 1 2 Rebecca Wearn (10 January 2013). "Bournemouth shines light on night time economy". BBC. Retrieved 28 March 2013. 1 2 "Statement of Licensing Policy" (PDF). Bournemouth Borough Council. 1 March 2011. Retrieved 12 March 2013. ↑ "Economic activity, local authorities in England and Wales". 2011 Census. Office for National Statistics. Retrieved 13 April 2013. ↑ "Centre may be shut over Christmas". BBC. 1 December 2005. Retrieved 12 March 2013. ↑ "Bournemouth, Garden by the Sea" (PDF). Diamond Jubilee Civic Honours Bid. Bournemouth County Council. May 2011. pp. 9 & 10. Retrieved 9 September 2012. ↑ "Bournemouth's Stag Culture". BBC Dorset. 26 October 2012. Retrieved 11 December 2012. 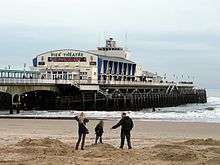 ↑ "Bournemouth happiest town in UK". BBC News. 8 March 2007. Retrieved 6 September 2007. ↑ "Cinemas and theatres". Dorset For You. Dorset County Council. Retrieved 21 May 2011. ↑ "Bournemouth venue marks 25 years". BBC Dorset. Retrieved 20 December 2012. ↑ "About the BIC". BIC and Pavilion Theatres. Archived from the original on 23 January 2013. Retrieved 23 May 2015. ↑ "About the O2 Academy". Academy Music Group. Retrieved 20 December 2012. ↑ "The Lively Old Lady". Dorset Life Magazine. Retrieved 20 December 2012. 1 2 3 4 "Bournemouth's listed buildings" (PDF). Bournemouth County Council. Retrieved 8 September 2012. ↑ "Background". Russell-Cotes Art Gallery and Museum. 2008. Archived from the original on 5 January 2013. Retrieved 4 January 2013. ↑ "The collections". Russell-Cotes Art Gallery and Museum. 2008. Archived from the original on 5 January 2013. Retrieved 5 January 2013. ↑ "Bournemouth, Garden by the Sea" (PDF). Diamond Jubilee Civic Honours Bid. Bournemouth County Council. May 2011. p. 2. Retrieved 9 September 2012. ↑ Physical Environment: Land Use Survey 2005 Published with the 2011 census. ↑ "Orchestra". Bournemouth Symphony Orchestra. Archived from the original on 4 March 2012. Retrieved 25 August 2009. ↑ Findley, Nick (1 July 2012). "Bournemouth Food and Drink Festival is hot stuff". Dorset Echo. Retrieved 29 January 2013. ↑ "Bournemouth Arts Festival by the Sea". Official Tourist Guide. Bournemouth Borough Council. Retrieved 29 January 2013. ↑ "AUCB helps launch Arts by the Sea Festival". 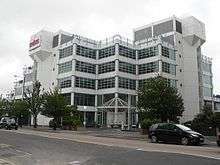 The Arts University College at Bournemouth. Retrieved 29 January 2013. 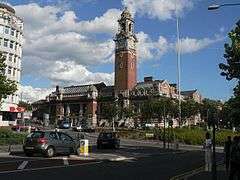 ↑ "Bournemouth pride parade award is tribute to organiser". BBC News Dorset. 6 July 2011. Retrieved 29 January 2013. ↑ "Bournemouth Air Festival 2008". Bournemouth Echo. 2008. Retrieved 6 January 2013. ↑ "Plane fascinating – Bournemouth Air Festival factfile". Bournemouth Echo. 2012. Archived from the original on 1 June 2012. Retrieved 6 January 2013. ↑ "Bournemouth Air Festival 2012". Bournemouth Echo. 2012. Archived from the original on 16 October 2012. Retrieved 6 January 2013. ↑ "One million people at air show". BBC Dorset. 2009. Retrieved 29 September 2013. ↑ Delahave, Ernst (22 May 2010). "Biography of Paul Verlaine". The Left Anchor. Retrieved 11 January 2013. ↑ Legg, Rodney (November 2009). "Tolkien in Bournemouth and Dorset". Dorset Life Magazine. Retrieved 12 January 2013. ↑ "Mary Shelley's Bournemouth legacy". BBC Dorset. 4 February 2010. Retrieved 12 January 2013. ↑ "Notes from a Small Island | Bill Bryson | Chapter Seven". Read Free Online Publishing. 8 May 1947. Retrieved 26 March 2013. ↑ "Who We Are". St Peter's Church, Bournemouth. Retrieved 29 July 2012. ↑ "Internal Architecture". St Stephen's Church, Bournemouth. Retrieved 29 July 2012. ↑ "External Architecture". 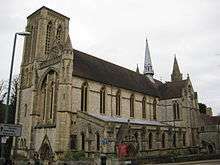 St Stephen's Church, Bournemouth. Retrieved 29 July 2012. 1 2 "Boscombe pier". National Piers Society. 2013. Retrieved 3 July 2013. ↑ "Neck or Entrance building at Boscombe Pier". National Heritage List for England. English Heritage. 2011. Retrieved 3 July 2013. ↑ "Britain's coolest pier". Bournemouth Borough Council. 2011. Retrieved 3 July 2013. 1 2 "The Town Hall". National Heritage List for England. English Heritage. 2011. Retrieved 17 September 2013. 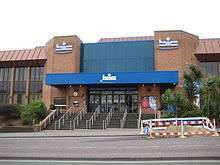 1 2 "Bournemouth Pavilion". Local Histories. BBC Dorset. 2009. Retrieved 8 September 2012. ↑ "Bournemouth Balloon Facts". S&D Leisure. 2012. Retrieved 8 July 2013. ↑ "About Us". S&D Leisure. 2012. Retrieved 8 July 2013. ↑ "Cherries Open Top Bus Tour". Bournemouth Echo. 2013. Retrieved 10 July 2013. ↑ "New sponsor deal for Cherries stadium". Bournemouth Echo. 2012. Retrieved 16 July 2013. ↑ "Rugby Sevens". 2012. Retrieved 17 July 2013. ↑ "National League Tables". National Clubs Association. 2012. Retrieved 17 July 2013. ↑ "Bournemouth Rugby Club". Pitchero Rugby Union Network. 2013. Retrieved 7 September 2013. ↑ "Bournemouth cricket club (about)". Bournemouth Cricket Club. Retrieved 9 August 2013. ↑ "Dean Park Cricket Ground". Bournemouth University. Retrieved 9 August 2013. ↑ "Premier League Darts 2013 Dates and Venues". Live Darts. Retrieved 9 August 2013. ↑ "About". Westover and Bournemouth Rowing Club. 2013. Retrieved 10 August 2013. ↑ "Watersports in Bournemouth". Watersporty. Retrieved 7 September 2013. ↑ "Boscombe's Surf Reef Project.". British Broadcasting Corporation. 2 November 2009. Retrieved 23 July 2011. ↑ "Rectifying Boscombe's Surf Reef.". Daily Echo. Retrieved 23 July 2011. ↑ "Boscombe surf reef 'should be demolished'.". BBC Dorset. Retrieved 29 September 2013. ↑ "A338 Bournemouth Spur Road – Major Scheme Business Case". Dorset for You. 2013. Retrieved 15 June 2013. ↑ "Roader's Digest – A35". SABRE. 2012. Retrieved 15 June 2013. ↑ "Protest pensioner halts A35 traffic in Dorset". BBC News. 2013. Retrieved 14 June 2013. ↑ "North Dorset MP, Robert Walter, to the House". Hansard. 2003. Retrieved 15 June 2013. ↑ "Services to Bournemouth (Coach Station Section)". National Express. 2013. Retrieved 15 June 2013. 1 2 3 "Public Transport". Bournemouth Borough Council. 2013. Retrieved 15 June 2013. ↑ "Yellow Buses – History". Yellow Buses. 2013. Retrieved 16 June 2013. ↑ "Getting Here". Bournemouth Official Tourist Guide. Retrieved 18 June 2013. 1 2 "South West Main Line, Route Utilisation Strategy" (PDF). Network Rail. 2006. Retrieved 26 June 2013. ↑ "Route 3, South West Main Line" (PDF). Network Rail. 2008. Retrieved 27 June 2013. ↑ "Somerset and Dorset Joint Railway History". Somerset and Dorset Joint Railway Trust. 2002. Retrieved 29 September 2013. ↑ "Our History". Bournemouth International Airport Limited. 2013. Retrieved 30 September 2013. 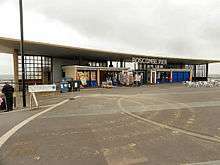 ↑ "Bournemouth airports terminal on course". Bournemouth Echo. 2010. Retrieved 30 June 2013. ↑ "Bourne Again – New terminal unveiled". Bournemouth International Airport Limited. 2013. Retrieved 30 June 2013. ↑ "Bournemouth Airport Facts & Figures". Bournemouth International Airport Limited. 2013. Retrieved 26 June 2013. ↑ "A Picture of Bournemouth" (PDF). Bournemouth Borough Council. 2011. pp. 11–12. Retrieved 21 November 2012. ↑ "A Picture of Bournemouth" (PDF). Bournemouth Borough Council. 2011. p. 12. Retrieved 21 November 2012. ↑ "A Picture of Bournemouth" (PDF). Bournemouth Borough Council. 2011. p. 13. Retrieved 21 November 2012. ↑ "Regional Picture: GCSE Results 2012". BBC. 2013. Retrieved 16 September 2013. ↑ "Diocese". Diocese of Salisbury. 2012. Retrieved 27 July 2012. ↑ "Archdeaconry of Bournemouth". Diocese of Winchester. 2012. Retrieved 27 July 2012. ↑ "Portsmouth Diocese Directory". Roman Catholic Diocese of Portsmouth. 2012. Retrieved 2 August 2012. ↑ "Plymouth Diocese Directory". Roman Catholic Diocese of Plymouth. 2012. Retrieved 2 August 2012. ↑ "Frankenstein author Mary Shelley's Bournemouth legacy". BBC Dorset. 2012. Retrieved 29 July 2012. ↑ "Origins". St Stephen's. Bournemouth Town Centre Parish. 2013. Retrieved 21 August 2013. ↑ "Church of St Clement". Listed Buildings. English Heritage. 2013. Retrieved 21 August 2013. ↑ "Who we are". St Augustin's. Bournemouth Town Centre Parish. 2013. Retrieved 21 August 2013. ↑ "A Christian service at the heart of Bournemouth". Richmond Hill St. Andrews Church. 2013. Retrieved 22 August 2013. ↑ "History". About Us. Richmond Hill St. Andrews Church. 2013. Retrieved 22 August 2013. ↑ "Religion". Neighbourhood Statistics. Office for National Statistics. 2013. Retrieved 15 August 2013. ↑ Ruth Pauline Goldschmidt-Lehmann (1973). "Anglo-Jewish Bibliography, 1937–1970". 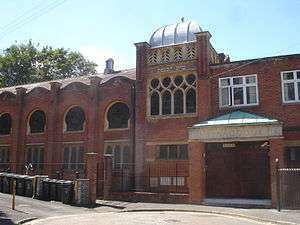 Jewish Historical Society of England. ↑ David Soetendorp (2003). "A Generation Confronting the Loss of Community". European Judaism. 36. ↑ "Faith". BBC Dorset. 2012. Retrieved 23 August 2013. ↑ "Dorset Humanists meet in Moordown, Bournemouth". Dorset Humanists. 2013. Retrieved 23 August 2013. ↑ "10 Reasons to Choose BU". Bournemouth University. 2013. Retrieved 22 September 2013. ↑ "Contact Details". Cobham Aviation. Retrieved 22 September 2013. ↑ "Bournemouth Bay Run". British Heart Foundation. 2014. Retrieved 22 September 2013. ↑ "BSO Our Vision". Bournemouth Symphony Orchestra. Retrieved 22 September 2013. 1 2 3 "Dorset Twinning Association List". The Dorset Twinning Association. Archived from the original on 21 June 2012. Retrieved 1 August 2013. 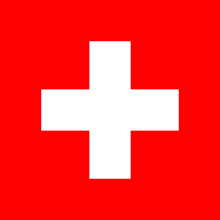 ↑ "Partnerstädte der Stadt Luzern". Stadt Luzern (in German). Archived from the original on 21 June 2013. Retrieved 1 August 2013.